Just got the new Basketmakers Association Newsletter. We were pleased to see that there was a report about the RHS Flower Show at Tatton Park this summer. 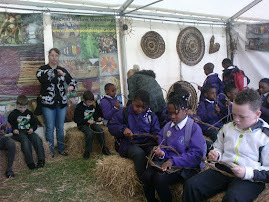 The BA had a stand there with basketmaking demonstrations and we had a large outdoor display with animal sculptures, baskets and a large willow dome. During the show Simone met several of the contributors to the BA stand when they came to examine our work. However the person who wrote the report for the BA must have missed seeing us as the report has no mention of Willowpool Designs, the North West's longest established full-time willow weavers. We have exhibited at Tatton Park, Chelsea, Hampton Court, Somerset Willow Fair and the Southport Flower Show over the years but we never get a mention in the Basketmakers Association's Newsletter. We are members of the Basketmakers Association. Over the years we have taught hundreds of keen willow students, some of them Basketmakers Association members but never manage to get reported in the newsletter. Guess that living in rural Cumbria is just too far from where its at in willow weaving circles and we are too busy trying to make a living from our craft to get involved in commitees etc. It would just be nice for someone to spot us and notice that we are doing our bit for willow. The people who really care about progressing and promoting true craftsmanship in the real world will always appreciate what you do and how hard you both work Steve - and if they don't? Well....., nil desperandum! We'll just keep doing it anyway eh? Because it's our life's blood. Thanks for your comment and encouragement. Of course we carry on working with children getting them inspired about working with natural materials, being outside and experimenting with design ideas. we really enjoy that part of our work and luckily can make an ok living from the different strands of our willow weaving. corny but true. Anyway Seasons Greetings to you. we are having an enforced break due to the snow but we cant wait to get out again and plant more willow! !